The Logan Education Association will hold two “Know Your Contract” training sessions on Tuesday, Feb. 19. The first session will begin at 3:30 and the second one will begin at 5:00. Each session will last approximately one hour, and members may attend either session. Please check your email for sign up and location information. The 2018 Hall of Fame Committee of the Logan Education Association is proud to announce the induction of two retired educators into the LEA Educators Hall of Fame. Inducted at the November 15th ceremony were: Nancy Jackson who was nominated by Beth Martin and Gretchen Gonzalez; and Cea Girardino who was nominated by Lacy Cox. In addition, Dixie Bowlby and Jeff North, who were inducted last year but were unable to attend the 2017 ceremony, were recognized at this year’s event. Two Citizen for Education Award winners also were honored at the ceremony: Gary Silcott, who was nominated by Craig Abram; and Kristi Brooks who was nominated by Jim Robinson. Congratulations to this year’s inductees and award winners, and a sincere thank-you to everyone who attended the ceremony and to the committee members whose dedication always makes this event a success. If you were unable to attend this year, please mark your calendar for November 21, 2019, the date of our next ceremony. And, if you would like to nominate someone for the Educators Hall of Fame or the Citizen for Education Award, it’s never too early to submit a nomination for next year. LEA Members — Please encourage your students to participate in this year’s contest. Access this flyer for more information AEW Contest 2018. Update: Student contest winners AND their teachers will receive a prize in this year’s contest! Enter today! Do you know a classroom volunteer, community member, or local business owner who makes significant contributions to the students of the Logan-Hocking Local School District? If so, please nominate him or her for the Logan Education Association Citizen for Education Award. Nominations for this award must be made by school employees. To make a nomination, please complete and return the Citizen for Education Award Form no later than Thursday, October 25. 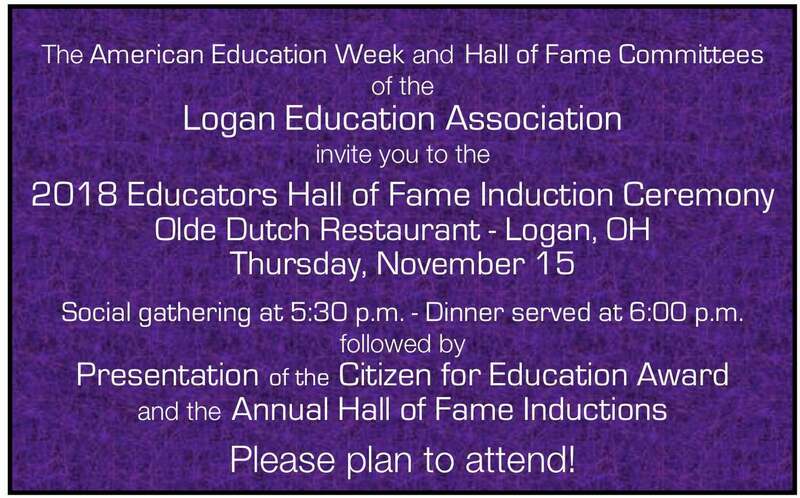 The Citizen for Education Award will be presented as part of the LEA Educator Hall of Fame Induction ceremony, scheduled for Thursday, November 15. The Hall of Fame Committee of the Logan Education Association is once again seeking nominations for the Educators Hall of Fame. To be eligible for induction into the Hall of Fame, educators must be retired from the Hocking County school system after having been employed at least eight years and must have shown exemplary dedication to the profession of teaching. If you or someone you know would like to nominate a former educator for induction into the Educator’s Hall of Fame, please complete and return the Educators Hall of Fame Nomination Form. Nomination forms are also available at the Logan Daily News office or the Hocking County Library. The deadline for nominations is Thursday, October 25, 2018. This year’s Hall of Fame induction ceremony is scheduled for November 15, 2018 at 5:30 at the Olde Dutch Restaurant.